In Part I we discussed the considerations for training the bike and run in hills. Let’s now turn our attention to racing a hilly course properly. Think of your legs as books of matches. The number of matches in your legs is finite, you only have so many to burn. Every time you spike your effort, significantly increasing your intensity for even a brief time, you burn a match. 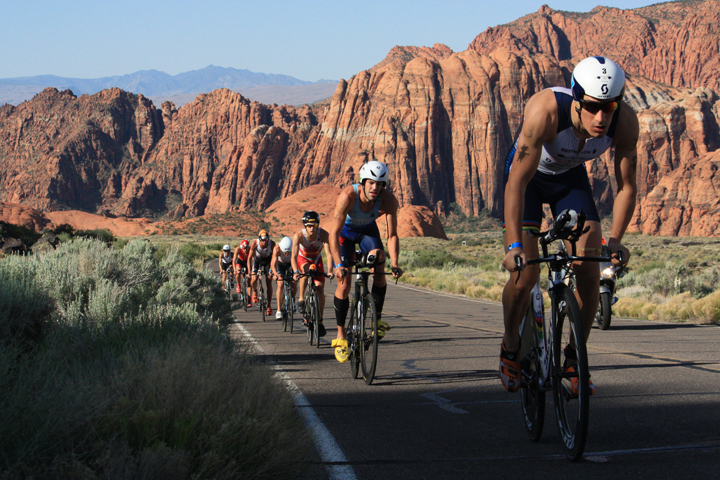 Your job when racing a triathlon is to burn your matches wisely, applying them to the course in a manner that yields the best result, and ideally burning your very last match with your last step across the finish line. It’s not difficult to understand that the longer the race the more stingy we need to be with where, how, and if we even burn a match. A steady effort that minimizes surges in power is the best strategy for limiting the number of matches burned on the bike, ensuring that we have enough matches remaining to spend on the run course. We all have a natural tendency to push harder, to spike our effort, to counter the increased resistance at the start of a hill. Heart rate lags effort by 60 to 90 seconds — by the time your heart rate rises to reflect a Zone 4 effort, for example, you’ve already been pushing Zone 4 for 60-90 seconds. The damage may have already been done. Meanwhile, everyone else around you is spiking their effort and you receive all this visual feedback that apparently it’s ok to crush the hill, because everyone else is. Feet, Shift, and Cadence: focus on the pressure on the soles of your feet and your cadence. Now, keeping that pedal pressure unchanged from what you felt on the flat, shift down quickly through the gears maintaining that same on-the-flats cadence. This attention to pedal pressure and cadence helps you avoid the power spike that everyone else is tossing out. Observe the Other Athletes: everyone else around you will not do this. They’ll spike their effort and surge ahead of you, quickly opening up a gap of several bike lengths. This is perfectly fine and is exactly what you want. Again, you’re using the mistakes of those around you to provide you with visual confirmation that you’re doing the right thing. Feet, Shift, and Cadence: put your focus back on your feet. Maintaining that same climbing pedal pressure, shift up through the gears, maintaining that same climbing effort across the crest and into the descent. Observe the Other Athletes: note their body language as they come immediately off the gas and begin resting at top of the hill, usually trying to recover from their much-too-hard effort up the hill. Meanwhile everyone else will begin coasting at a much lower speed, giving up this free speed opportunity. This about riding the bike you should vs the bike you could. The bike you could ride is the one that gets you around the bike course fastest and this may not be through the steady application of power. But you’re a triathlete, tasked with running off the bike. The bike you should ride is the one that creates the bike split that sets you up to run well off the bike. And this Should vs Could style of riding becomes much more important as the length of the race increases. The longer the race, the more important it is to know where and how the hills are. And if the hills are near the end of the run course (for example, Ironman Lake Placid and Chattanooga) this becomes the driving factor for the rest of the race. It’s critical that you race the bike and early miles of the run in a manner that sets you up to be successful in these late hills. The cost of failure on hills in the last miles of an Ironman can very quickly shatter the gains of your shiny bike split or your sparkling performance in the first 6 miles of the run. Pace: GPS watches have become very affordable. Running with pace, especially on a flat course, gives you a nearly objective measure of work performed — 8’/mi pace on Tuesday is 8’/mi pace on Thursday, run on the same course. Running the same course next week at 7:50 pace is a clear demonstration of having made yourself a marginally faster runner. That’s a good thing! Heart Rate: most of these GPS watches include the functions of a heart rate monitor. Through observing your heart rate at various paces you’ll begin to attach pace expectations to heart beats and vice versa. Race of Perceived Exertion (RPE): finally, throughout these interactions between pace and heart rate, you’re also tuned into how this all feels — your breathing, fatigue, etc. Over time, through miles and miles of simply paying attention to interactions between pace, heart rate, and RPE, you’ll gain an awareness of your body that will guide you on a hilly run course. For example, you’re running 9′ pace on flat ground at heart rate X and RPE #Y. As the road goes up, shift your attention away from pace and more towards HR and RPE, keeping them within a reasonable range of what you were experiencing on the flats. Yes, you may be required to run a bit harder but the key is to be very self-aware, running only as hard as you should, not as you could. In the end, racing well on a hilly triathlon course is about increased self awareness and discipline: knowing how hard you’re working, at all times, and having the discipline to perhaps do less work despite everyone else around you often working very, very hard. Focus on the long game, exercising patience and discipline. Good luck!